This home is located in Helena's North Valley on a large .41 acre lot. It is in "like new" condition and is very energy efficient with low utility bills all year round! This home has 3 bedrooms, 2 baths and an open concept living area with lots of natural light! The kitchen has beautiful dark cabinets, stainless steel appliances and a large peninsula for all your food prep and entertaining needs. The lot is landscaped with beautiful low maintenance rock. There is a massive asphalt driveway...enough room for numerous vehicles, trailers, ect. There is also a 2 car detached garage and the lot is spacious enough to even add an additional garage/workshop if so desired. You can’t beat the location as it is close to unlimited outdoor activities including fishing, hunting, hiking and more! National Forests are in every direction from this property and this home is close to Canyon Ferry Lake, Hauser Lake, Holter Lake, the Missouri River, Black Sandy and White Sandy Campgrounds, as well as, Great Divide Ski Resort. 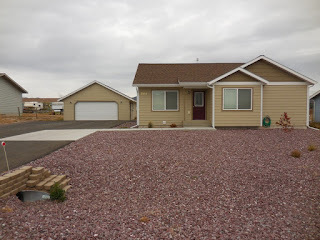 Call or text Grant Bonnice at 406-439-0059, for your showing today!